Privacy and Identity Management for Community Services (PICOS) is an international research project, focused on mobile communities. 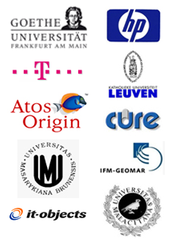 The PICOS consortium consists of eleven partners from seven different countries, supported by the EU as a part of the Trust & Security Group within the 7th Research Framework Programm. It contains specialists from the fields of science, research and industry. Online communities connect millions of people around the world, to communicate, interact and share interests. As these communities are getting more mobile, becoming an ubiquitous part of our lives, new opportunities and challenges emerge. PICOS has the mission to investigate mobile communities and their services. Especially regarding aspects like privacy and identity management as well as technical and economical aspects. Start to learn more about PICOS here.